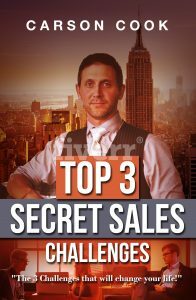 The “Top 3 Secret Sales Challenges” book & workbook is the perfect tool that you can use to build and master a perfect sales foundation. The main factor that drives success in business is connections. Connections with your clients, customers, employees, associates and family are what drive the success in your life. How do profitable and lifelong connections start? They start with understanding Empathy, Positivity, & Praise. Carson is a passionate sales person who has spent more than 10 years making deals, selling products, and inspiring sales around the world. His passions include interpersonal communication, closing, and working with international businesses to improve their marketing and sales staff. Carson has worked in consulting for several years and has improved sales centers in USA, India, Mexico, Bangladesh, China, and Nepal. He has also trained hundreds of sales professionals in sales communication, client relations, and finance. Currently, he manages several sales-related businesses including inside, outside, and digital sales outlets. Carson specializes in finance and sales- from initiation to close. His expertise lies along interpersonal communication and same-day or one-call closing.